Growing up, this poster hung (or, okay, most of the time was propped on the floor) in my parents' bathroom. I would sit sometimes and just study it -- study the bellies, the bios, the birth histories captured in so few words. 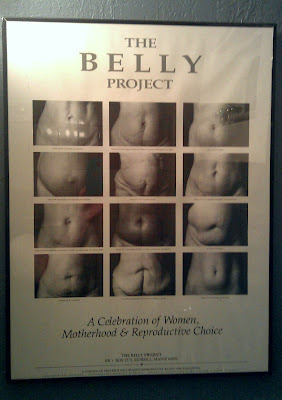 I would peer at the bodies pictured, and match the bellies I saw to the bellies of my mother, my aunts, my friends. I'd study waistlines and pantlines and imagine the bellies hidden underneath: Would she look like top right? No no, maybe bottom right. I'd sit and wonder, Which would mine become? I sat and I stared and I found beauty in them all -- and in my mother, my aunts, my friends, my future self. I fell in love with bellies because of this poster. It hangs now in my office bathroom. It's not an ideal thing -- not enough visible bodies of color, lacking an acknowledgement that not only women birth, that there are so many routes to motherhood -- but like the bellies pictured, like my belly, like yours, it is a beautiful, beloved thing.